Cut the bread slices into about 3 strips per slice. In a large skillet or frying pan, heat about 1/4″ of vegetable oil (not olive oil; you need an oil that can withstand high temperatures like peanut oil) over medium heat. In a shallow pan or pie plate, combine some sugar, salt, vanilla, milk, flour, and baking powder, then whisk in the eggs. Test oil heat by flicking some water into the frying pan. If it pops, reduce the heat. If hardly anything happens, turn up the heat. If it sizzles, it’s just right. Working quickly, take each strip of bread and soak it both sides in the milk/egg/flour mixture. If you leave it in too long, it will get soggy, but you want to make sure enough of the egg mixture has soaked into the bread. Gently shake to remove excess batter and place in hot oil. Cook until puffed, golden brown, and a nice, crispy crust has formed on each side (probably 3-5 minutes per side; you really need to babysit them and make sure they’re cooking correctly) and then remove from oil and drain on a paper towel. While cooking remaining French toast, keep cooked pieces warm in an oven set to the lowest temperature setting. 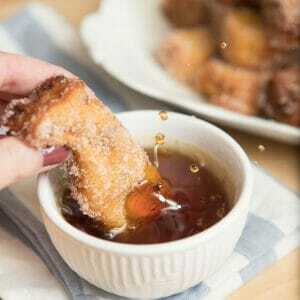 When ready to serve, roll each piece in cinnamon sugar. Serve these in some maple syrup, buttermilk syrup, strawberry syrup, spread some honey butter on there. Try serving these at a breakfast or brunch party with an assortment of dipping sauces!